No matter which holiday you celebrate, December is an action-packed month. The season has a way of getting ahead of me and this year it’s been no exception. We started with an extreme ice and snow storm the week of Thanksgiving (the end of November) — which included 20 hours of power outages over the course of two days — and then have had wind storms, excess rain, and lots of visitors to our house. So I feel like I started out behind on my holiday preparations and then got further behind. Not that I really mind — it’s all been fun. Oh and there’s been LOTS of Christmas quilts to finish for clients. I just finished the last quilt to be done for Christmas yesterday so I’m just getting some giftmaking and shopping done, and I’m finally posting some more blocks of the Behemoth for month #2. This block was supposed to be for November but it’s stretched into December so don’t worry if you’re not caught up yet! You’ll have plenty of time as we’re poking along here. This is a gorgeous block and wonderfully shaded with lights and darks, which can give it a 3D feel if you look at it just right. I built it with Thangles, which isn’t in the pattern directions, but you can successfully follow the pattern directions instead if you prefer. With Thangles you’ll wind up with two full blocks, one that spins to the right, and one that spins to the left. If you’re making the larger version of the Behemoth, you’ll need four extra big blocks anyway, so just start up a spare parts bucket and by the time we’re done with the 12 months of blocks, you’ll have a few good spare pieces to get you started on your extra blocks. 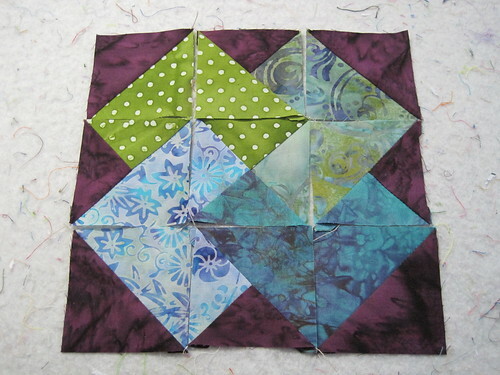 When I look at this block, I see a pinwheel made of stripped components. That is, there are four very large half-square triangles, that same quilting atom again, spun around like a basic pinwheel. Each triangle half, though, is made of a light and dark strip, making it a compound triangle. However you make your ‘End of Day’ block I hope you enjoy it. It’s fun to play with values and see if you can get enough contrast to get the 3D effect that makes this block sing. Take time to enjoy the season and your celebrations, and stay ‘sew’ happy! In today’s exciting episode of atomic quilting, we’re going to consider a hybrid atom that is really very useful: the three-part triangle. (In Thangles instructions this is often called a ‘tulip square.’) And we’re going to look at this atom in the context of building a Behemoth block, from month #2. Yes, I’ve finished mine (it was supposed to be for November), and no, I haven’t posted any pictures yet, at least not here. But the whole photostream is on flickr so if you click on that link, or any of these pictures below you’ll get to the album full of Behemoth pictures from October and November. It’s the ‘card trick’ block that’s so interesting, and I made it last, but I’m going to show it to you first. In the Behemoth directions, Julie shows this as a three color block, and I made it with five colors. Take your pick of how you’d like yours to look. 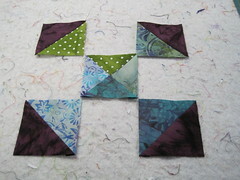 I made the block with Thangles but of course you can use your favorite way to make half-square triangles and related pieces. With the Thangles I made make all the pieces from one strip size; depending on the method you may need to cut up to three different sizes of squares or triangles. If you break this block down into quilting atoms, it contains three different atoms, each successively more complex, although they each finish out to the same size. There are four half-square triangles (HST) on the corners (one each of each colored ‘card’ and common background); one quarter-square triangle (QST) in the center (with four different colors of the ‘cards’); and four three-part triangles (if you can think of an appropriate abbreviation let me know), each one containing two colors of ‘cards’ and the common background color. 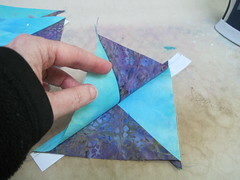 First, I made the half-square triangles of the four colors plus the background. 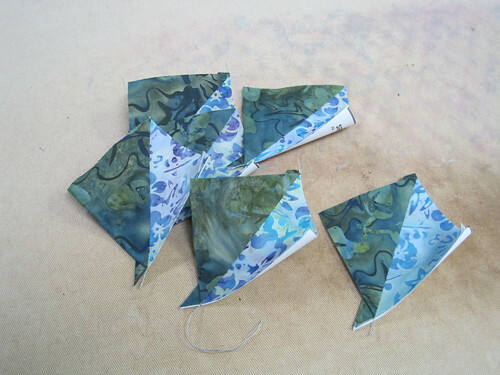 I cut the Thangles paper into individual pairs, so when I sewed these, I wound up with two HST of each (I only show one here, in each corner). I used all of them though, more on this in a moment. Then I made the quarter-square triangle in the middle, by making two pairs of half-square triangles in light/dark combinations. 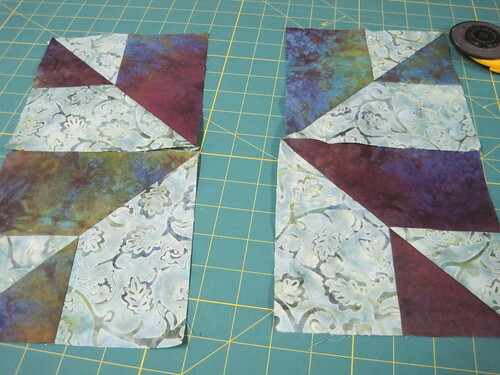 I then sewed one pair together for the center QST. (The alternate pair will be spare.) You wind up with one QST in the correct size, and one hatchling of smaller size, which is also spare. These hatchlings, by the way, are the result of using only one strip size to begin with, rather than cutting each piece to different sizes. I don’t mind them, and usually find other uses for them, but if they bother you, use a different method for your QST. Cool, eh? Once you finish all the three-part triangles, the block looks like the picture at the top of the post. It gives the illusion of the color ‘cards’ overlapping each other, which I think is wonderful. Sure, the block is fussy, and it takes a fair amount of diligence to get the colors right, but when you do, it’s an entertaining illusion. And by breaking it down into component atoms, it makes the block construction simpler to understand, and scale up or down, as you choose. So if you haven’t started on your Behemoth yet, don’t worry! Make the blocks in your own way and time. You’re going to gain a month as we’ll use December to catch up. (I don’t know about any of you, but the snow/ice storm and ensuing power outage shredded my schedule last week!) I won’t post any of the third block until January. We will still have the open sewing studio date in December, though, so feel welcome to come and sew on whatever blocks you’re working on. And get your free teeny weeny holiday gift! And in the meantime, enjoy the holiday season, and happy sewing! So (sew!) 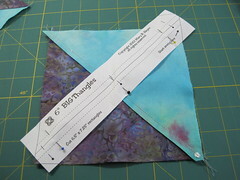 to finish up your first block of the Behemoth, you need to make up some giant quarter-square triangles. Like its less complicated cousin, the half-square triangle, the name refers both to the single triangle as well as the assemblage of the four, usually alternating in lights and darks. 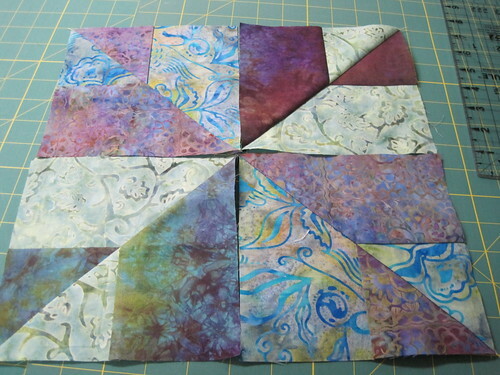 I used the larger of the ones shown below for the block. A quarter-square triangle takes up a quarter of a square, and is the shape that happens when you drawn two diagonal lines within a square, both lines corner to corner. (And the half-square triangle is what happens with only a single diagonal line in the square, corner to corner). 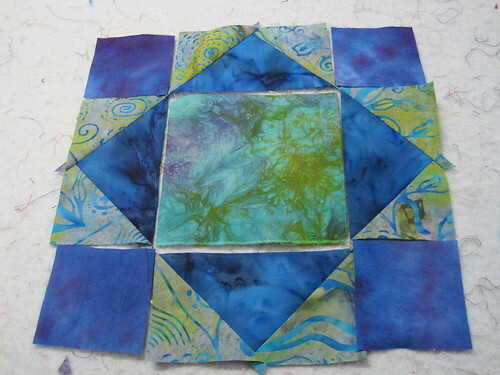 And like its plucky hard-working cousin — which appears in so many quilt patterns — the quarter-square triangle (QST) is a versatile quilting atom that can be constructed in LOTS of different ways. I chose a non-conventional way because it’s easier with what I have on hand. 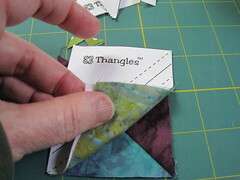 In any case, the QST is a little further down the food chain of piecing because you need to make at least two half-square triangles (HST) first. Or halves of HST’s first if that’s your method. 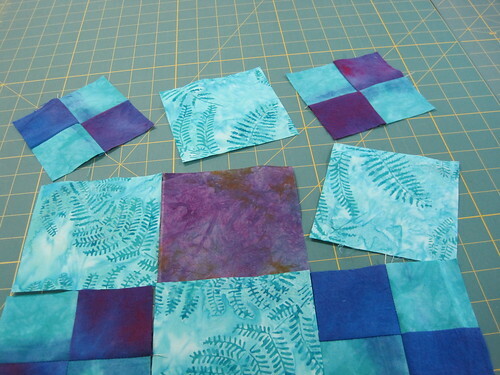 If you consider that a QST has to be seamed twice before it’s inserted into the block then you can understand why you have to start with larger pieces than simple squares. That is, if you want all your results to be the same size. I was happy to create QST’s of different sizes, because I may use those in other Behemoth blocks. 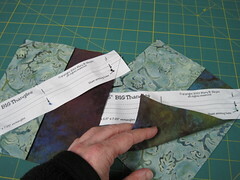 In this case I wanted my final QST’s to be 6.5″ square (so they would wind up in the finished quilt at 6″ square). So I cut my initial pieces of fabric to 6.5″ by 7.25″ rectangles of two different sets of lights and darks. This is the size that the Big Thangles paper needs — and each rectangle pair will produce two identical HST’s that wind up at 6.5″ square. But if I simply sewed the HST’s together on the diagonal to produce the QST’s, they would both be too small for the size that fits my block. 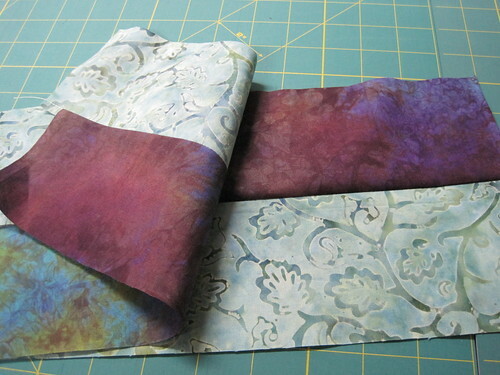 So I used the Thangles paper again, sewed on one diagonal, and then on the smaller one, and would up with QST’s that are 6.5″ and roughly 5.5″ (which I can use in a later block). 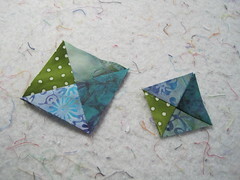 If you click on any of the pictures below, that sends you to the flickr album that has the tutorial for making these QST’s this way. So with all the components finished, I could finally assemble block#1 of the Behemoth on my design wall. I’m pretty happy with how it turned out and can’t wait to add some more fabrics. I hope you’re enjoying this project as much as I am! 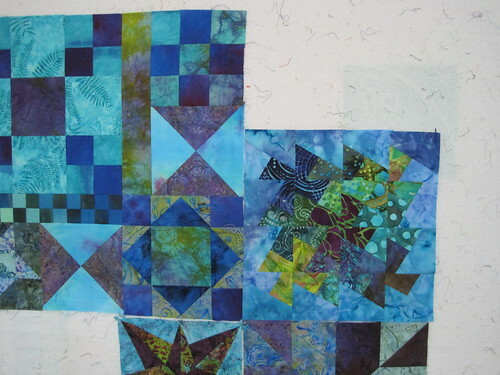 There are some things I might do differently if I made the blocks again — but that’s part of the fun, getting to learn something about piecing, and yourself, in the process. 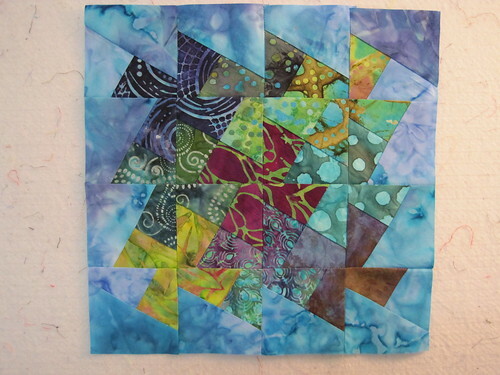 Next to the superhero square, the half-square triangle is probably the most important sub-atomic unit in quilting. The half-square triangle appears in all sorts of patterns in lots of combinations, so it’s worth getting to be friends with. In the Behemoth block, it appears in the Friendship Star, which is the second to last part of block #1. So I feel compelled to try to explain it a bit even though it is a huge hairy topic in quilting, which invokes emotionally charged responses like in discussions of politics or religion. And a little like religion, everyone is pretty much sure their way of making these little units is the best way. Here are the beauties I sewed for the Friendship Star. So let’s start with these as an example of the half-square triangle unit. A half-square triangle is the triangle that happens when a square is divided along its diagonal. 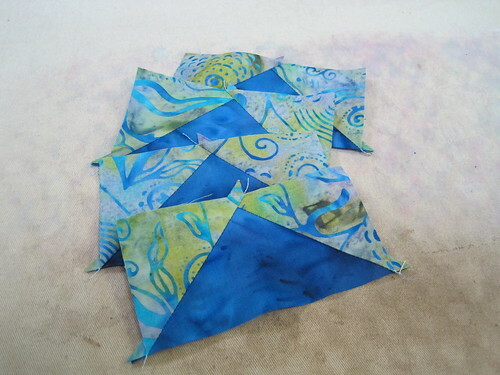 That means that if you cut a triangle like this out of fabric, the long diagonal edge is on the bias. And bias means STRETCH. 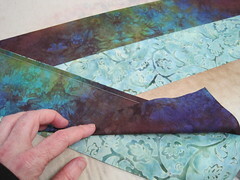 Fabric has the most give (distortion) along the bias. 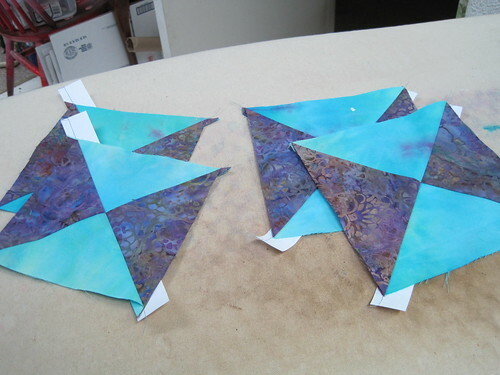 So if you cut the triangles and sew them back together to make a two-triangle square (don’t worry, here’s where some of the confusion lies — this compound unit is ALSO called a half-square triangle, or HST), the piece will distort as you sew. If you’ve starched the heck out of it, it might distort only a little. But if your feed dogs are a little aggressive and the fabric has a lot of give, you’ll wind up with a diamond or trapezoid instead of a square. WAH. In the past I’ve trimmed many of these oddly shaped little units down to their more accurate size, but that means you have to start with bigger triangles than the match tells you, to accommodate the accumulation of sewing mistakes. 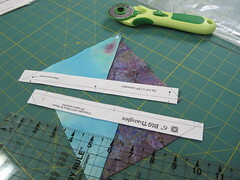 So here’s one place where I substantially differ from Bonnie Hunter, the genuis behind Quiltville.com: I don’t cut triangles first, unless it just can’t be helped. I always sew first, then cut later. If you sew the diagonal seam while the weave of the fabric is intact, it stabilizes the bias and prevents a lot of the distortion that happens when you sew on bias edges. 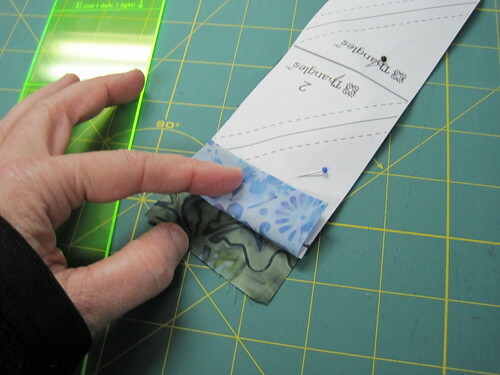 The other thing is that although you can mark your own sewing lines, and cut the odd size strips that HST’s call for, I have come to prefer sewing on pre-marked lines on Thangles paper, on normal pre-cut (by me or fabric companies) strip sizes. It helps me make the most of my limited piecing time. This is where I started for my Friendship Star adventure — by layering two identical size strips over each other, light over dark, and pinning on Thangles paper of the appropriate size. 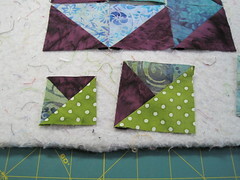 Then I sewed on the dotted lines, cut on the solids, and after pressing produced the half-square triangles seen above. Actually in the view of the HSTs above (first picture in post) I haven’t yet removed the paper. If you leave the paper in when you press, that also stabilizes the bias and prevents distortions from the ironing. For a survey of half-square triangle construction methods, try this link: half-square triangle goodies. Yum! Lots of great stuff here. There’s even triangle paper you can print out on your printer if you like that sort of thing! 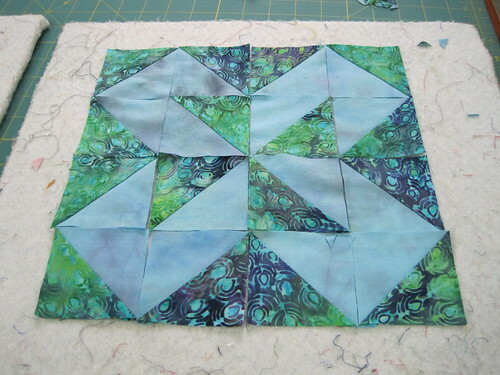 After the Friendship Star, the only thing left in our Behemoth block #1 is two giant quarter-square triangles, which I’ll tackle in the next post. 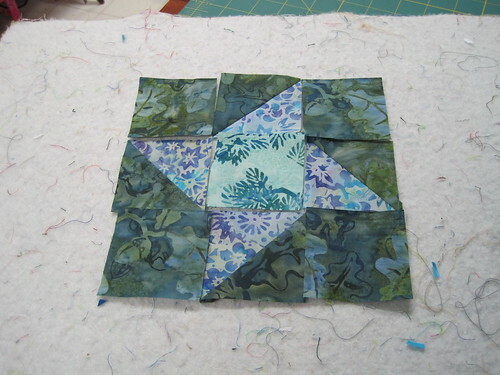 And of course I’ll post a photo of the finished block #1. Okay, for those of you who noticed that the quilting ‘atoms’ I’ve mentioned so far — the four-patch and the nine-patch — are they themselves made of smaller units — good job! You’ve discovered one of the great difficulties of modern science — deciding which are the smallest, indivisible pieces of matter. You see, every time the scientists think they’ve found the smallest piece, they find that those pieces are made up of even teenier pieces. But for us in the quilting world, what’s an elementary particle? Why, something that’s sub-atomic, of course. The obvious unit in this case that is smaller than the four-patch and nine-patch atoms — the square. Here, for instance, in the ‘economy’ block of the first Behemoth installment — squares are the fillers at the corners and hold open the vast space in the center. 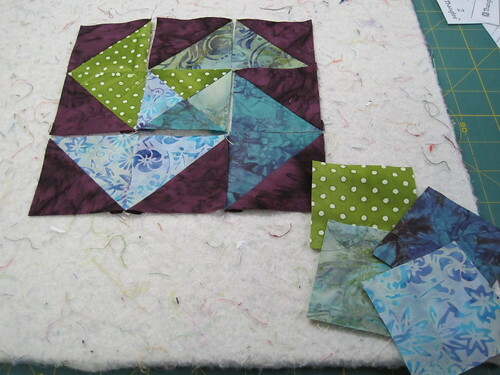 The economy block consists of four flying geese (those triangle in rectangle thingies), and five squares, one of which is larger than the others. 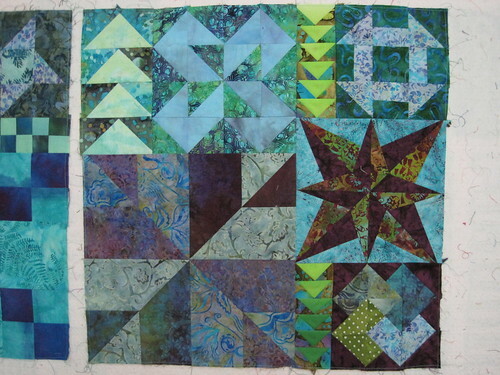 And even though there are nine pieces to this block — after the flying geese are assembled — it isn’t considered a nine-patch, because the grid of the block is 4 X 4. So it’s kind of a four-patch. Or a 16-patch if you want to be more accurate. The math definitely works out better if the finished dimensions are divisible by four. 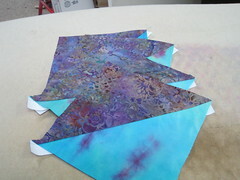 Haven’t made flying geese before? No problem. 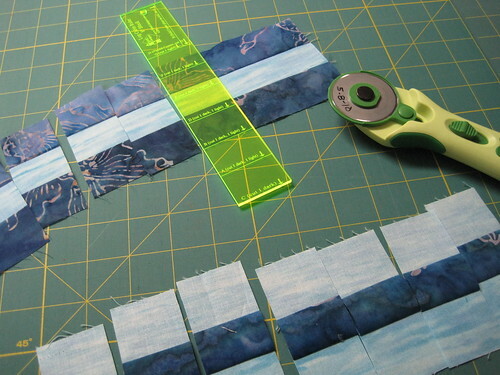 Click on the picture link below and it will take you to the flickr album of pictures (it’s the last one in the set, so you’ll have to get back to the beginning to see the process) about making flying geese with the ‘Lazy Girls’ No Math Flying Geese x 4 ruler. Flying geese are proportionally twice as wide as they are tall, and the tip of the triangle is at the halfway point. Well, it will be after it’s sewn in place :). And I think flying geese are useful enough — and appear often enough — in patterns that we might as well consider them another quilting atom. I found a searchable quilt image index site composed by several museums, and have enjoyed looking through their collection. Try the link — where I’ve already put in the search term ‘postage stamp’ — and you’ll get to see several postage stamp style quilts, made entirely of small squares (often as small as an inch square finished). Postage stamp quilts were often scrappy — meaning they had more than a few fabrics –and sometimes were even ‘charm’ quilts (where no two fabrics were the same). See? It makes everything we’re doing look simple! No discussion of the fundamental units of quilting would be complete without the mighty nine-patch. In fact when my daughter and I made our first quilt together, we sought advice about patterns and were led to the nine-patch, perfect in its simplicity and beauty. It’s where we began our quilting journey. Of course the nine-patch atom is a little more complicated than the four-patches in the foreground of this picture, in that the nine-patch is a three-by-three grid construction compared to a two-by-two. It is a useful quilting unit: it can easily be scaled up and down, and can be substituted for plain squares, just like the four-patch, and will similarly make chains if placed in alternating locations. And likewise there are related ways to build a nine-patch. You could cut individual squares and sew them together, but because I’m an impatient and not terribly accurate sewer, I prefer to start with strips that I cross-cut and then sew back together. This gives me both more speed and accuracy — more efficient overall. But of course your yardage may vary :). You’ll need two strip sets — one with dark, light, dark and the other with light, dark light, as in the photo below. 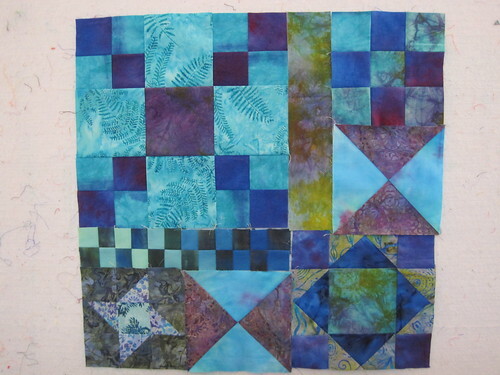 The blues are for the nine-patches, the yellow and blue strip above is for four-patches. Press the seams toward the dark (more on this in a later post) for both sets and then cross-cut in the same strip width that you began with. 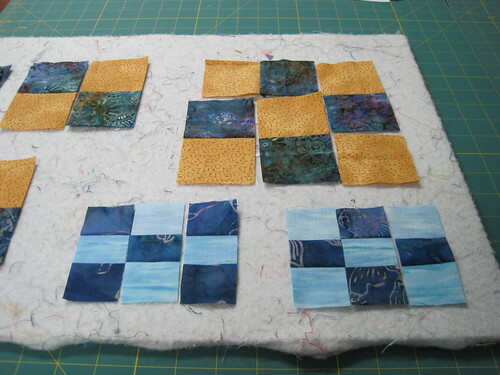 Assemble in alternating sets for lights and darks to complete nine-patches of both varieties and then finish by pressing in whichever direction helps the block lay the flattest. 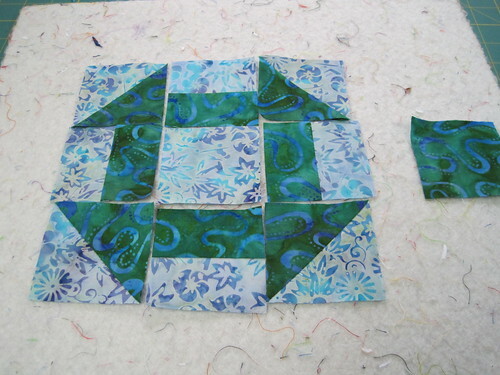 Here’s another trick I learned from Bonnie Hunter at Quiltville.com: you can also make a nine-patch from four-patch halves and pieces. 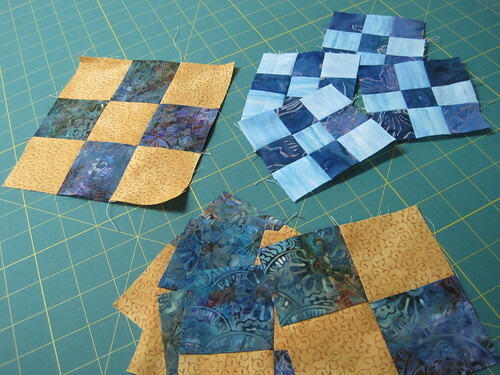 Using the yellow and blue strip set, I cross-cut into four-patch halves and then arranged them into most of a nine-patch — you just need a plain square to complete it. 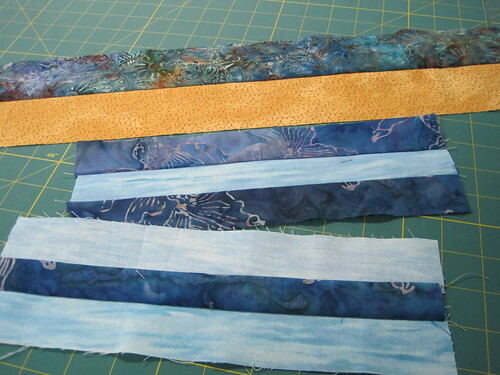 So depending on which strips you have available, and what sizes, and how many sets you want to sew together — and how many nine-patches you need to make — now you have a few choices of how to approach it. The top right nine-patch was made with four-patch units and a plain yellow square; I hope you can see the spaces between the pieces. There’s a nine-patch block in the first of the Behemoth blocks, so by now you should be able to make the plain strip, the checkerboard strip, the Thrifty block, and the nine-patch. Steaming right ahead there! The word atom comes from the Greek word ‘atomos’ meaning ‘indivisible,’ or what it has become in science, the smallest unit of matter. (the fact that modern science has gone beyond atoms and studies strange new sub-atomic particles like ‘charmed quarks’ we’ll ignore for the moment). So maybe it’s no surprise that I approach quilting with an atomic sort of point of view, considering I have a strong grounding in science and engineering. I break every quilt block down into its smaller units, into units that are bite-sized and manageable — quilting ‘atoms’ as it were. A great example is the ‘Thrifty’ block, a key element of the first block of the Behemoth. Its components are squares and four-patchies, arranged in a nine-patch layout. 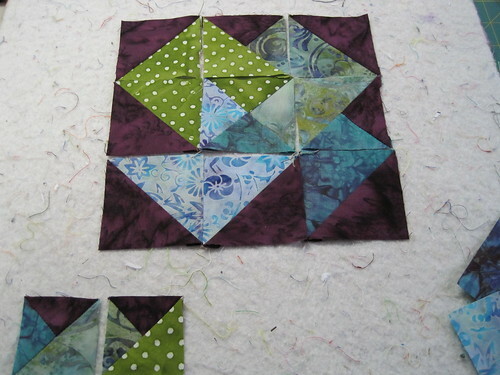 In my last post I talked about making four-patchies, and here’s a splendid use of them. A block beautiful in its simplicity and utility. 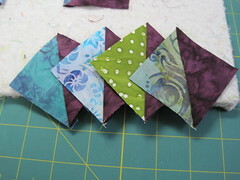 This makes fantastic diagonal chains when set alternately. Also provided you keep the same proportions, the block is very easy to resize. 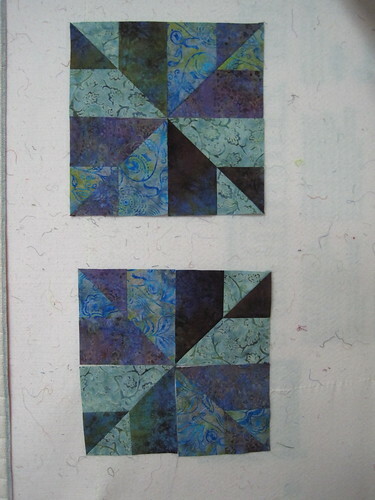 Bonnie Hunter at Quiltville has some great tips on making four-patchies in her free scrap pattern Four-Patch and Furrows. She uses her four-patchies to make into larger 16-patch checkerboards, definitely worth checking out. She has a simpler kids’ pattern, too, just with four-patchies and squares, called I Spy a Four-Patch. Here you can definitely see how four-patchies make great chains when you line up their colors and/or values. So there you have it. 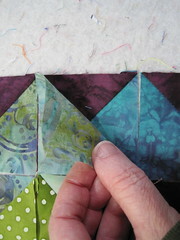 Four-patchies are one of my favorite quilting atoms, and are among the most versatile quilting units there are. They are easy to make — easy to vary in color and size — and easy to compose with. In any pattern when you see a fairly large-sized square you can use your favorite large-scale print — or substitute a four-patchie instead.